Peter’s session went down really well, so I asked him to share some of those things here. Peter: “Yes it’s been a busy few weeks since we met in Malaysia and it was great to come back and launch two major projects. The first was a special project for the forthcoming Islamic Museum of Australia,http://www.islamicmuseum.org.au/ which is an impressive $10 million initiative partially supported by the Australian Government. My involvement actually dates back to mid-last year when I joined three fellow Australian Muslims travelling 13,000km across the Australian outback to explore and document historical Muslim connections in our country (which are surprisingly rich and deep). Indonesian traders visited regularly long before British colonization, and our oldest mosque dates from the 1860’s. 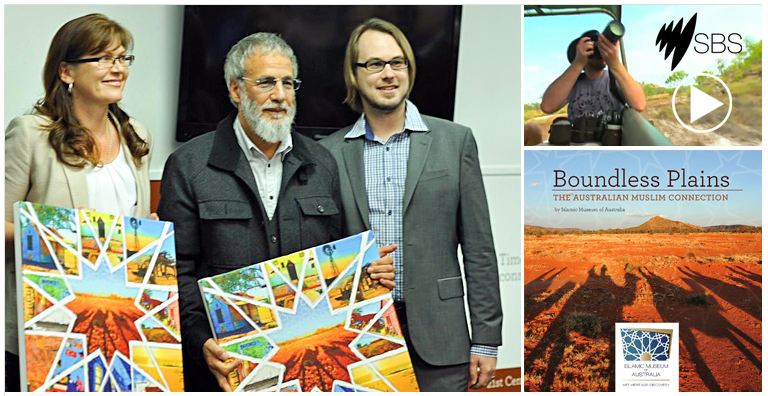 My role specifically was to photograph the journey, and then design and feature the images into a coffee table style book and exhibition, which we launched with Yusuf (Cat Stevens). When developing the branding and identity, I wanted to feature a strong ‘desert’ red & brown outback feel highlighted by some contemporary typography and geometric patterns. Our documentary will feature soon on national TV; and personally, it was one of the most rewarding projects I’ve been involved with – both creatively and spiritually. Working for one of Australia’s most iconic design institutions was initially a little nerve-wracking, as they attract over 600,000 visitors a year and expectations were high. My intention was to re-imagine some familiar Islamic design elements such as calligraphy and geometric tiling (the likes of which I’d studied in Morocco and Syria) with a contemporary, edgy street style. I enlisted the help of a dear friend, calligraphy master Haji Noor Deenhttp://www.hajinoordeen.com/ with whom I often collaborate. The results were very well received and the Museum curator actually just sent me a glowing testimonial, which was wonderful after completing such an inspiring and rewarding project. Even though the exhibition has just opened, it’s been a hit with plenty of press and positive reviews, alhumdulilah.